Just as May 4th has become a special day for Star Wars fans, March 10th is now considered Mario Day. Why? Because writing out the date looks like the name of the video game icon (MAR10). To celebrate, Nintendo has a number of deals lined up including one we told you about the other day. From March 10th (which is tomorrow) through March 25th, the complete Super Mario Run freemium mobile video game is 50% off at $4.99. But suppose you want to celebrate Mario and not have to shell out any cash to do so? 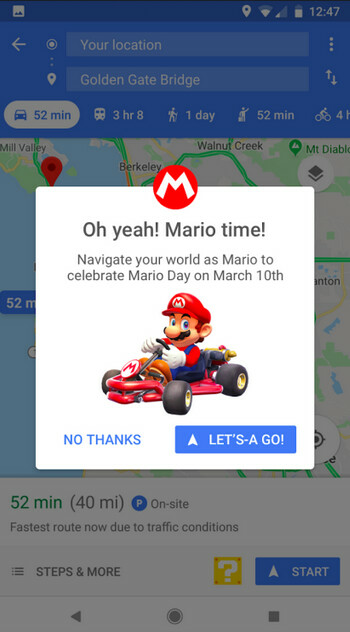 As it turns out, Google has pushed out an update to Google Maps that will replace your location icon with the image of Mario driving his kart. This will be available to Google Maps users for one week only. To have Mario lead you on your journeys using Google Maps, you will need to make sure that you have the most up-to-date version of the app. Open it, and tap on the yellow block with the question mark inside, located to the left of the Start button. Tap it, and for one week you and Mario will be following the same directions. I could see in the future a bunch of different cars or other graphic items be available to use. Who knows maybe they will allow you to use any custom avatar or graphic. If it meets some certain size criteria.